One of the views from the bathroom. A shot of the bedroom from a different angle. Another view from one of the bedroom windows. And the views keep coming. The hospitality section of the suite. The usual mini refrigerator filled with over priced drinks. The second empty refrigerator to fill with hopefully your own drinks and left overs. The controls for the fancy Japanese commode in the Aria corner's suite main bathroom. The japanese commode that does everything and more then you might want. Night time view from one of the bedroom windows. I recently read a trip report where someone had turned down a upgrade to a Aria corner suite because the desk clerk told them the suite only had one television and they like watching in the bedroom. The desk clerk was incorrect, the corner suite has 3 TV's, one in the bedroom, one for the living room and one for the bathtub/sink area in the master bath. It was time to get my gamble on, so why the photo of the drink instead of a slot win? Well you actually have to have a decent slot win to get a win photo. I could fill up pages though of losing slot photos if I had thought to take them. I tried everything at Aria and couldn't get a hit much over $200 and this was betting the pennies, the dollars and the $5 slots for the next 2 days. The hits that were around $200 were from $5 Pinball and Top Dollar and when betting $10 a push I usually expect more then a $175.00 or $200.00 win but that is what I was getting during those rare moments when I actually had a win. Terri and I had dinner our first evening at Aria at Julian Serrano. We had a nice back corner table as I requested and service was good. The drink above was the spicy strawberry cocktail recommended by our server and it was quite good. The shrimp with garlic was delicious and I would order it and the cocktail again. The presentation and taste of the lobster and pineapple was fabulous and definitely something I would order again. The above salad had heirloom tomatoes with goat cheese and mixed greens and we both liked it. Coca Mallorquina or in other words, spanish pizza! Excellent, try it you will like it. Fried dates with bacons and almonds. What's not to love? Delish! Terri's mushroom risotto which she said was excellent. Yes, we ordered a lot of tapas as was pointed out to me mid-dinner when someone replied to one of my tweets wanting to know how I was eating all that. Our last tapas was the steak and cheese with honey and pecans which sounds like a strange combination but works and is good. We skipped having dessert at Julian Serrano's because we had plans to join our friend Hayleymsmom from the blonde4ever Vegas message board for a late dessert at Cosmopolitan. Luck still being sour at Aria, we walked over to Cosmopolitan to meet Hayleymsmom (HM) and I stopped off at the high limit lounge to play the Davinci Diamonds slot that was so generous to me in March. I had a couple decent hits on it, that made me hopeful my luck was changing. This kind of hopeful feeling throughout my trip kept me playing. We met up with HM and since Terri had taken her to make a offering to Buddha while I was wandering around the Chandelier bar, I then felt I must make a offering while also getting a photo op with HM. We managed to completely block the Buddha sculpture but if you really want to see if check out one of my previous Cosmopolitan trip reports. After some discussion we ended up having a liquid dessert at Cosmopolitan's Holstein bar and restaurant. I ordered the frozen grasshopper shake for $11 which was peppermint meringue, chocolate crunchies, creme de menthe, and Van Gogh dutch chocolate vodka. It was yummy but very rich and I had to leave half of it. Here's a close up that shows the cute little meringue garnish on top. HM ordered the drunken monkey which had reese's pieces, banana, malt and frangelico. Cute name but I thought my drink was better and HM ended up leaving more then half of it so I think she felt the same. Terri ordered a coke. We had a lot of fun and actually ended up closing out Holstein's. I'm not usually the last one out the door of any place, but we were having fun. We peeked in a few shop windows and then HM said goodnight and Terri and I continued to gamble. It didn't take long for my luck at Cosmo to turn to the dark side so we returned to Aria.Terri was having some luck at Aria that evening but I just continued to lose until it was time for bed. 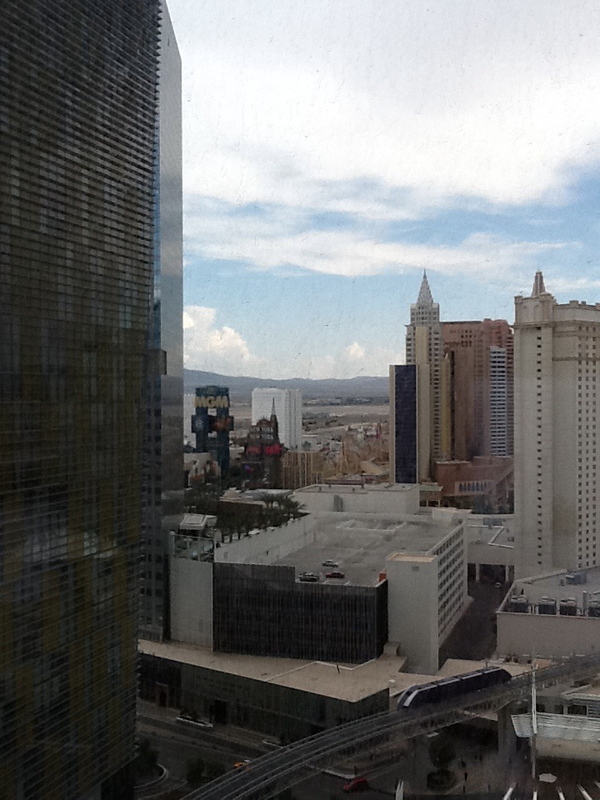 Once back in the suite I must have spent a good hour just admiring the view and activity on the strip that I could see from my bed. I slept in late the next day and ended up ordering lunch from room service. I had the shrimp which was tasty and their version of a Mexican pizza. I never eat pizza crust, I just eat the toppings off so given that quirk of mine I can't tell you if it was a great pizza, just that the toppings were tasty! After eating lunch I had a call from Terri and I joined her for a drink at Cafe Vettro while she ate her breakfast. Reviews of Cafe Vettro aren't very good and the place lived down to its reputation in food quality and service. After Terri's brunch we decided to go over to Palazzo as she needed to pick up some eyeglasses she had ordered from a store there and I wanted to get my new Grazie Platinum card. On my way to get my card I found a bank of the new WMS Alice slot machine and decided to play for a $1 without my grazie card. Well, wouldn't you know it I started hitting every bonus this slot had to offer? I was afraid to change it to max bet since it might stop the bonuses and they were cute. Above is a photo of where Alice decides to turn some of the reels completely wild on the Mad Hatter Tea Party slot. Then I hit for $132.00 on a respin feature. The bonuses just kept coming, I had visits from the Queen of Hearts, the caterpillar, the Cheshire cat who also gives wilds, but not of the whole reel, and then the game's main bonus which I really enjoyed. I'll have more details on this slot when I write up the Palazzo stay of my trip report, including links to some videos. After fun on the Alice slot and walking away a winner of $150.00, I stopped by my favorite Wolf Run to donate a quick $100.00. About a month earlier when I called up to confirm my room comp and reservation the person I was talking to said something like well you're Platinum so you will get a upgrade on check in. I replied back and said I was gold and her reply was do you want to speak to your new host? I declined the offer since I wasn't ready to speak to my new one since I was sad my previous one had quit and moved out east. After I hung up from the call it got me thinking about what she said so I logged on to my Grazie account and sure enough it was showing me as Platinum level. Hmmm, did they make a mistake in my favor? To test out if I was really Platinum I went to the Palazzo's card desk told them I had forgotten my player's card and asked for a new one. Sure enough the one they reissued me was Platinum. I was happy to get it as the perks include limo service and VIP lounge and check in, so the first thing I did was drag Terri to the Platinum lounge for cappuccino's. While there the server came out with a tray of temptation or as some would know it chocolate croissants and I couldn't turn that down. I still wasn't sure what was going on with my Grazie card level but decided not to look what might be a gift horse in the mouth and to save my questions for the new host when I would check in there on Sunday. Terri and I returned to Aria where I just continued to lose until it was time to eat dinner at Lemongrass. We started with the chicken satay which is tasty and has a nice presentation. I ordered a watermelon and Vodka drink which was good, though a bit less lime would have been better. Terri ordered Chicken Chow Fun, which I tasted and thought was good but a bit mild for Thai food. I like the garlic pawns but had to give them a bit of kick with some hot sauce as they were mild. Lemongrass has the mildest Thai food I have eaten lately. I wish they asked when ordering what level of spice one wants in their food. We both skipped dessert. After dinner I got a bit more play for my money at Aria but the losses just continued so I went to bed earlier then usual and spent the time in my suite admiring the views and watching some TV in my bedroom. When I first returned to my room I turned on the living room TV for the first time to find out it didn't work. Not wanting maintenance in my room at night I called up and requested they fix it after I checked out the next day. 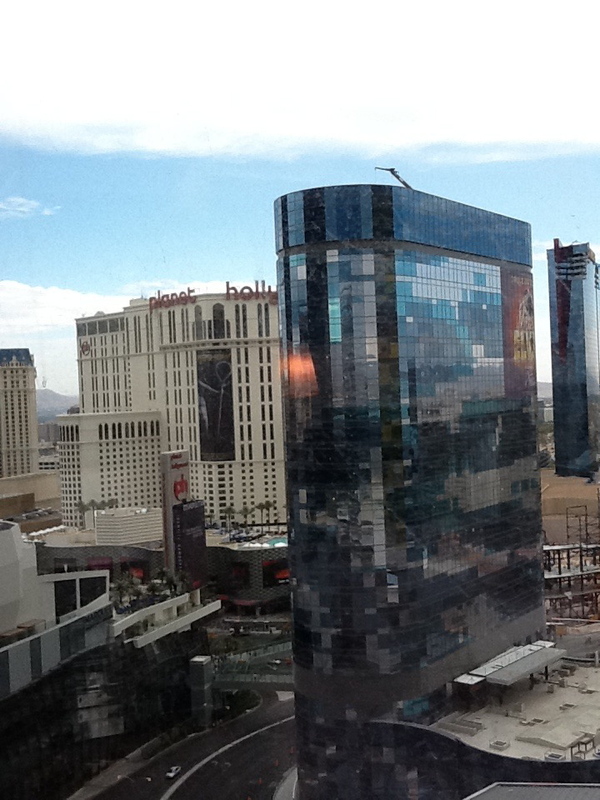 I've read some past Aria trip reports that indicate problems with their TV's is not unusual. The next morning I didn't sleep in quite so late as the people on the floor above me was making a lot of noise with their children and it was coming into my room. Terri and I decided to check out and eat breakfast at Cafe Bellagio since I would be checking into Bellagio for 3 nights with my husband for the "All Stars Slot Tournament". Check out was easy for both Terri and me and everything was comped off without touching our express comps. My stay at Bellagio with lots of photos of the slot tournament will be covered in another post in a couple days. Cheers! Love the report and detail and pics. 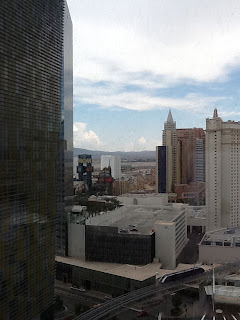 Can't wait for the Bellagio and Palazzo portions to follow I hope soon as I am hitting Bellagio at the end of August and look forward to getting a look at your experience there recently. Thanks again for the efforts on the reports they are the next best thing to being there!! Ken, I was a bit luckier at Bellagio (just not lucky enough) as you will see when I post that section this weekend. Good luck on your August trip! We will also be there the end of August but this time not staying at Bellagio but THEHotel at Mandalay Bay and then Palazzo again. Didn't we determine that they had reduced the Platinum level to 175,000 points? We are considering tow nights there in November. i love reading your blog. I'm a teeny tiny gambler, usually just minimum betting on the penny slots. I could spend all day in a casino just watching people gamble. But, when i read your blog, it does inspire me to bet more. I'm slowly inching my way up. I've won on min bets, but one can only hope to aspire to greater heights! Just Deb, I'm glad you are enjoying the blog. Part 3 of this latest trip report should be published soon, in fact I'm working on it today. I think if you are having fun betting minimum that's the important thing, just have fun!